Today is the day! Today we find out who will be named the new Celebrity Apprentice. I don’t know about you, but I am so excited and happy that Clay Aiken is a finalist and has a great chance to win. Clay deserves to win and I refuse to think any other way. Luckily I will be at the show tonight, ready to cheer Clay and enjoy seeing the confetti moment in person. And,of course, I will report what I can about what we saw at the taping. I read an interesting article at the HuffPost – Gay Voices. Written by Michelangelo Signorile, the articles discusses Clay’s involvement with Celebrity Apprentice, North Carolina’s Amendment One and many more topics. A few days before his face-off with Arsenio Hall on the finale of Donald Trump’s “The Celebrity Apprentice” (Sunday night on NBC), Clay Aiken was confident and comfortable. Aiken also weighed in on his new-found role as a gay activist, taking on North Carolina’s antigay Amendment One and appearing on CBS’ “Face the Nation” opposite the Family Research Council’s Tony Perkins last week, an experience he laughingly still can’t believe happened. 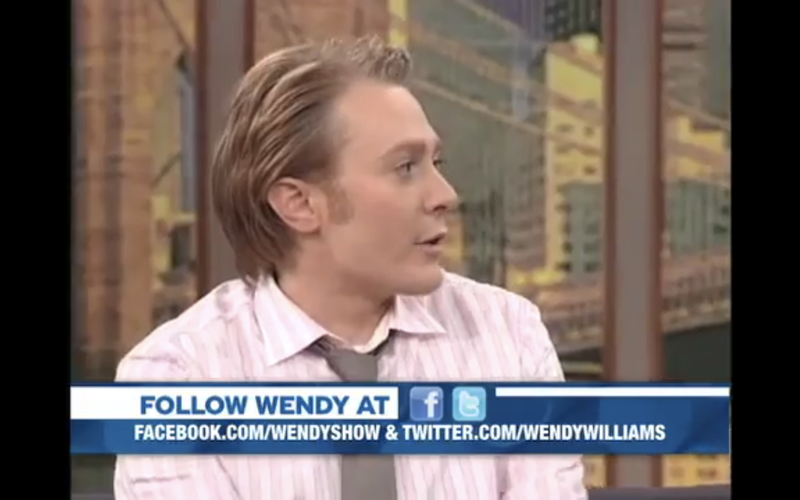 The following are some screen-caps from the Wendy Williams Show. Thank you to the ladies at CV and CB for providing them. musicfan, I can't wait to hear ALL about it. Of course, I am on pins and needles. I want him to win so badly, but I know he is already the winner in so many ways. There have been many good things to come out of The Celebrity Apprentice. For me, I love the many people who have come up to me and said now I know why you have been such a good fan of Clay's for so many years. He is so articulate, smart, funny and a great man with a fantastic voice. I am so proud of Clay. Great interviews. In the shared interview Clay outshines Arsenio, and as much as I like Arsenio, I want Clay to win it all. He deserves it. The nerves are setting in, but I am confident that Clay will win tonight. He really deserves to win and I don't see how Trump could be blind to that fact. So excited for tonight. Clay was far and away the better player. Of course 9 years ago he was far and away the better singer! Musicfan, I'm so glad you'll be representing us at the finale tonight. ENJOY!!!! Have a wonderful time – you deserve it. I have enjoyed this site very much! I couldn't help but think that a Clay / Aresenio talk show would be interesting and in several ways ground breaking. Interesting – Clay has the fan base to tune in on opening day and give it ratings. He would be the Regis of the pairing – quick, funny, intellegent and sane of the two. Arsenio would be the draw for the celebrity guest list and the unpredictable funny furious(Kelly) to Clay's serious. Would it be the first black/white – old/young duo in talk? Musicfan, you are too cool. Have the best time, we'll all be waiting to hear from you! Musicfan….have a wonderful time tonight at the Finale…GO TEAM CLAY!!!!!! Clay has proven himself during this entire season. He deserves to win. Clay is a class act. Loved that interview. So rooting for Clay tonight. I really hope he wins. Go Clay! Error: Error validating access token: Session has expired on Tuesday, 21-Aug-18 16:13:01 PDT. The current time is Sunday, 21-Apr-19 22:04:11 PDT.